Are Millennials Buying Real Estate? Owning real estate is a key vehicle to build and transfer wealth over one’s lifetime and is a big motivator to buy a home. Millennials know this but have continued to rent due to economic conditions – not their so-called obsession with avocado toast. There is overwhelming evidence that suggests financial struggle during the Great Recession of 2008 stunted the growth of millennial homeownership rates. In fact, in the decade before 2015, home ownership amongst those between the ages of 18-34 dropped nearly 10 percent. What’s Stopping Millennials from Buying Homes? Evidence suggests that many factors from generational lifestyle changes to record high levels of student debt are driving millennials to live at home with their parents or rent. As of the second quarter of 2018, there was $1.53 trillion in outstanding student loan debt across the United States, a 6.25 percent increase from the year before. According to the Census Bureau, there is a continuous uptick of millennials from the ages of 24-35 living at home. This could very well be the impact of the ever-increasing cost of student loans, coupled with the fact more millennials are waiting longer to get married and start families of their own. The impact of the Great Recession on millennials is very real. The lasting effect of a recession caused by corruption and greed forces the next generation to think twice about home valuations and buying real estate. So, they continue to rent, especially in dense urban areas. Business Insider performed a study that says the reluctance in millennials buying homes stems from an 8.5 percent increase of millennials moving into the city. This is surprising since rent expenses in the city usually cost more than a monthly mortgage payment for a starter home. A report by Urban Institute explains that millennials preference for where they want to live has a bigger impact on why they’re choosing to rent rather than their views on homeownership itself. The report found that millennials want to live in major metropolitan cities where the cost of homeownership is out of reach, so they’re turning to rental properties instead. Budgets, Government Insured Loans and Other Ways to Save! If millennials are being held back by student loan debt, economic anxiety and other various factors but still want to buy a home, there are budgeting tips they can use to save money. First, they can take advantage of financial automation, which helps people stick to a budget. For example, if you’re trying to save $500 a month for a down payment, you can set up an auto withdrawal with your bank, so the money is pulled from your account before you even notice it’s there. This helps eliminate any temptation to spend that cash on a lavish vacation you probably don’t really need. Another great way millennials can take advantage of cost-saving initiatives are loans backed by the Federal Housing Administration (FHA). FHA loans usually have less stringent qualifications for home buyers. If you have a credit score below 620, but above 500, there’s a good chance you’ll qualify for the home. FHA backed mortgages may also cover closing costs and even allow you to put down only 3.5 percent of the final purchase price of the home. With Quicken Loans, you can apply for an FHA loan online and chat with a Home Loan Expert to determine whether this kind of loan is right for you. 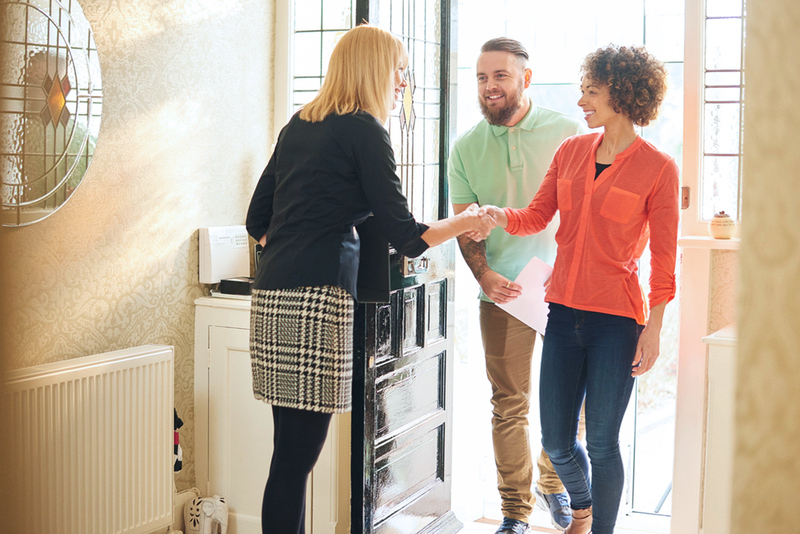 Buying a home for the first time can be intimidating, but there are some signs that can help a potential buyer decide if it’s the right time. First and foremost, a buyer must be physically and mentally ready to take on the responsibility of being a homeowner – including all the menial chores, maintenance, renovations and so forth. The next step is applying for a mortgage. At this point, lenders will look at a potential buyer’s debt-to-income ratio and adjust as needed. So, if a buyer is looking to qualify for their dream home, it may be in their best interest to hold off until they’re able to lower their debt-to-income ratio as much as possible. Home buyers then need to compile the cash for the down payment, which is usually between 5 and 20 percent, as well as any associated closing costs. Third-party closing costs are comprised of several different fees, ranging from appraisals to simple courier fees. Closing costs vary by county, city and state. Other signs that it may be time to move into a house include a low-interest rate environment and the time of year. Buyers should strive for low-interest rate environments, as it will make a lasting impact on the APR of their new home. Seasonality helps buyers gauge the number of other buyers in the market. In the spring and summer, home prices naturally rise due to the high demand in the market, so buyers tend to face a bit more competition during this time of year. Buying a home for the first time is not only a large task financially but moving from an urban apartment to a house or condo can be just as challenging. Millennial homeowners have to decide how to fill the extra space, stay up-to-date on maintenance and deal with homeowners insurance. Often, a home is going to be larger than an apartment and first-time home buyers will need to purchase new furniture, gadgets and other expensive appliances. Instead of going straight to IKEA, HomeGoods, or Wayfair and buying out their entire stock on a line of credit, first-time home buyers should furnish slowly and think through their purchases. It may be awkward to live in a semi-furnished space for a while, but it’ll be worth it when you look around and see things you truly love instead of expensive items bought in haste. Check out local estate sales, consignment stores and online garage sales before heading to the big box stores. Usually, secondhand stores will have furnishings and accessories made from high-quality materials that are built to last, unlike most mass-produced furniture. After all, the millennial generation is the king of DIY, thrifting, recycling and repurposing, so they should use that knowledge when furnishing their first home. Unlike renting, home buyers are responsible for the home inspection, as well as all maintenance and repairs. Upon moving in, it’s important to think about how much DIY maintenance you can handle and what you’ll have to hire out. Luckily, in this day and age, DIY maintenance is easier than ever, even if you’re not particularly handy. YouTube is a great resource for looking up how to perform simple tasks, like tightening screws or attaching door knobs. But homeowners shouldn’t get too excited about doing it all themselves. Some tasks, like dealing with electrical wires or plumbing, can be risky, especially without experience. Homeowners should have a reliable contractor on speed dial for these types of jobs. Outside of maintenance and furnishings, home buyers will have to manage other expenses, like homeowners insurance and claims. Homeowners can shop around online or through an agent for the best policy. Rates will vary depending on geographical location, home value and other factors. Once the owner has their policy in-hand, they should know exactly how and when to make a claim. Millennial homeownership rates are not as high the previous generations because of a multitude of factors – student loan debt, economic anxiety and their propensity to live in dense, urban areas where rentals are plenty – but, with financial creativity, restraint and a DIY mindset, millennials can overcome these challenges and start on the path to homeownership. Mike Genna is a contributor at Benzinga where he covers investments, cryptocurrencies, brokerages, and more.